Ice fishing on the Restigouche was a way of life for a lot of people in the Dalhousie area during the hungry thirties. Even today every winter sees from a dozen to thirty or more shanties hauled out onto the ice, usually just to the west of the Upper Wharf where large ships load concentrated ore for distant ports. The wharf is constructed at the north end of what we called Loggie’s cove. The cove itself starts about two hundred feet from the west end of William (Front) Street and runs in a northerly direction to a point about 1/2 mile out into the river. In summer the wharf made a dandy place to fish from although about all one caught in the warm months were small perch. I did catch a monster perch there once but that is another story. Just to the West Of the wharf there was once a ridge of rocks rising maybe fifteen feet from the water at high tide. During construction of the paper mill from 1926-28 much of this rock was hauled away for fill so that only two very small islands remained. Today the area between these rock outcrops and the mainland (the cove) has been filled and one can drive to the rocks. The outcrop was important because it formed the edge of what we called the South Channel which also runs adjacent and parallel to the side of the wharf. When the tide was rising or falling the current was very strong in the channel and along the wharf. The Restigouche River at this point is about five kilometers wide. There is another channel, the North (main) Channel about one kilometer further out. The whole river freezes solidly from shore to shore by the end of December each year. Early in December the shanties were hauled out onto the cove since this area was first to freeze. The ice was then five or six inches thick and would support a horse. Slits were cut twelve inches wide into the ice and “Box nets” were lowered that were efficient at catching smelts. Several hundred lbs. of smelts could be caught during each tide, i.e. twice each day. The shanties were very small structures usually four by six feet. They could be hauled by two people on a small sleigh. I’ve seen them hauled out on 4’x8’ sheets of metal roofing that came from the burned out Sidney Lumber Co. Mill nearby. Incidentally all of the metal in that old mill was recycled in 1942 for war material. The shanties themselves are interesting. They were constructed from just about every kind of building material known. During the thirties a sill of 2"x4" supported 2"x4" stud walls. This was covered with a light cardboard produced in the paper mill that was used to wrap the newsprint rolls. Laths were then nailed over the cardboard. The construction was the flimsiest possible but it was also light. The roof was made of 2"x2" and covered with anything that would keep the snow out. This type of construction would only last a winter or two and some were left on the ice to drift away in the Spring. The floor was made of ordinary boards. Plywood being almost unknown then. A trap door was cut into the floor that ran the full length of one wall. That was covered over when the shanty was vacant and generally prevented the hole cut into the ice under the shanty from freezing. A small stove made from a five gallon metal container with a small stovepipe going up through the roof provided the heat, usually either too much or too little. A bench ran along the wall opposite the trap door, the whole allowing three people to sit and fish. The doorway was on the end of the shanty opposite to where the stove was. Lengthwise on the ceiling and over the hole was a 2"x2" from which six fishing lines were attached. Under the bench were located three empty boxes (wood butter boxes being ideal). These had the tops on and about six inches from the front side removed. When a fish was caught it was unhooked and tossed between the knees into the box under the bench, where it would hop all over inside the box. When the fishing was good the noise coming from the boxes was like heavy rain coming down on the roof. The shanty was raised about nine inches above the surface of the ice and snow was packed all around the outside. Water from the fishing hole was splashed over this which soon froze and anchored the building to the ice. When one arrived at the shanty in daytime the first thing was to start a fire in the stove while a second person placed the trapdoor outside and cleaned the hole of slush with a piece of wire screen. The lines were baited with a small piece of fish left over from a previous time and lowered so that the lowest hook rested about 6“ from the bottom. Inside the cove the water at low tide was only about 5’ deep and about 9 or 10 when the tide was high. There was very little current. Each line carried three or four hooks. One below the sinker and the others above. Very soon the coats came off as the stove heated up the small area quickly. A spear made from a broom handle was sometimes used. This had three tines attached trident fashion. A small rope was passed through the top of the handle and tied to a rafter. Often a school of smelts would swim by about a foot under the ice. The spear was then aimed and thrown lightly at the largest fish with some success. Fishing at night, which some said was better, was different. While during the day one could see down into the water about five feet, at night it was inky black. At first an old kerosene lamp was let down into the water as far as the wick mechanism and secured there with a wire attached to a rafter. This seemed to bring the fish but one couldn’t see past the lamp. A reflector, one taken from a street light being ideal, was set down over the lamp chimney and allowed some vision into the water. Better still it kept the cold water splashing from the fish line when a fish was caught from striking the hot lamp glass chimney and breaking it. It meant however that it took the place of one or two of the fishing lines. One tried to arrange it so he could start fishing when the tide started to rise. After an hour or so of just catching the odd fish the smelts began to bite, all of a sudden every hook on every line had a smelt on it making it a busy and happy time indeed. The activity lasted for a few minutes, then a lull until another school came by. The whole might be repeated only once or twice or it might continue for an hour. The most productive times were those which coincided with the large tides of the full moon. One had to continually adjust the length of line to keep the lowest hook at the proper height. It was accomplished by having nails driven into the overhead crosspiece and the line could then be wound or unwound to suit. The best bait was either the silver wedge piece between the gills on a smelt or a piece of the large gut which was harder and stayed on the hook better. A knife was great to cut out the wedge piece but when a school was running it was much faster to simply bite out the piece. Sushi anybody?. A few weeks later when the ice was thicker in the South Channel the shanties were moved to a location about 100 feet north of the rock outcrops and right over the channel where the fishing was usually better. When the big tides were running I have often caught 400 to 600 smelts during a single tide. When I was about 13 it was difficult to find a shanty with room to fish in. The only thing left was to cut a hole in the ice of the Cove and try to find a piece of tin or cardboard to set in the snow as a wind protector and fish in the open. It was a miserably cold way to fish and we never fished that way after dark. 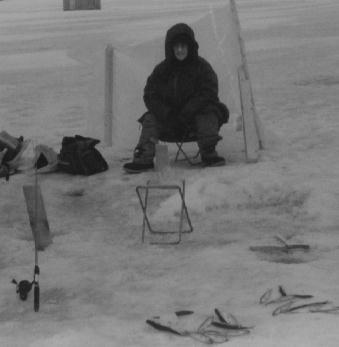 There was only one time when I caught about fifty smelts that it seemed worthwhile and even then I had to quit because of the cold. As I got older and was able to help shanty owners get their gear out on the ice I got more opportunities. In 1942 Paul-Emile Arseneault, a neighbour, let me fish overnight with him about a dozen times. The tides were right and his shanty new and well heated. We caught lots of smelts and had little trouble selling all we caught. It was hard when you fished all night to keep awake in school next day. In January of 1944 I worked split shifts in the machine shop at the mill and when I worked days I would fish through the night with Leolin Chiasson. I did not need to fish to earn money then, but went because I liked fishing. I quit the machine shop job to join the Army and in the week or so in between I fished every night. Again the tides were right and the catches fabulous. I had a hard time giving away all I caught. Only once after that did I ever make a good smelt catch with hook and line. In 1967 I was living in Dalhousie when a longtime friend and neighbour Aurele Firlatte invited my wife and I to his shanty to fish. It was located curiously enough on the south side of the wharf and only about fifty feet from it. That area is now completely filled in. There was only about six feet of water, no current but lots of smelts. Aurele had brought his wife Maxine and in addition to my wife Opal I had my son Danny with me. We fished less than 4 hours but when I counted our share the next day we had more than five hundred. In 1989 I made the trip to Dalhousie to fish with George Allard, my nephew, and Greg Waite my nephew in law. We rode out on a snowmobile on a very warm night late in January. It was so mild that we had no need to light the stove. We fished with our sleeves rolled up and the door open. As we sat there fishing we could see the lights along the front street and a blinking sign that advertised pizza. Greg jumped on his snowmobile and in a short time returned with large pizzas. We did not catch many smelts but it was the first time that I had eaten restaurent food while fishing in a shanty. Today I can drive to within one hundred feet of the shanties and get to a restaurent anytime I choose. Times have changed. The water in the 1930’s in the South Channel was maybe fifteen feet deep at low tide and six feet or so more when the tide was high. The current was always very strong sending the heavy lead sinker way out under the ice, up river with the incoming tide and downriver when the tide was ebbing. At the time of tide changes everything was still for fifteen minutes, even the fish stopped biting. Things have changed physically a great deal in the past twenty years. A few years ago I went fishing in the same place and was surprised to find the water depth, even at high tide to be only about ten feet. I then noted that the new wharf to accommodate the large ore carriers had been constructed right over the channel. The location of the South Channel passing the rocks had changed and had now filled in. There was hardly any current passing close to the rocks. There is also no chance of moving the shanties a little farther out because a paper company tugboat makes regular rounds taking out any ice formations that might support a shanty. As it is the shanties are a scant three hundred feet from open water. There are a few hardier souls who haul their now better constructed (and larger) shanties out to the North Channel. Its a long walk over the bleak ice at night. Mostly these owners use snowmobiles, both to haul their shanties and to commute back and forth. There are only three or four out there each year each, each about half a mile from the other. Its hard to get information on whether the fishing out there is better. My guess is that it is. This brings up a question. The fish seem almost always to be going upstream with the tide. I’ve seen very few coming back with the outgoing tide. The overwhelming majority of the smelts caught in nets and by hand fishing occurs when the tide is rising. They can’t all be staying upriver because salt water runs out in less than twenty miles. Which route they take back appears to be a mystery. Certainly they don’t come back via the South Channel. The Gaspe coast is on the other side of the river and its shallower there according to marine charts. I’ve never seen even one shanty on that side of the river. Did we ever catch anything other than smelts? Very seldom. Occasionally a tomcod, maybe one per night. I have caught maybe a few very small flatfish but don’t recall the occasions. I’ve heard once of somebody catching a small eel but that one must have been lost because eels migrate in the Fall to the Sargasso Sea, that area between the West Indies and the Azores where they supposedly mix with their European cousins, breed, and return each to their own side of the Atlantic in the Spring. The young eels (Elvins) are four years old before they take on the cylindrical shape of eels. The last few times I’ve been in a shanty I noted many forms of sea life I had not noted when I was young. Most likely the fishing was done then where the current was strong and would have swept away that which I have observed lately. There are now a number of transparent shrimps that vary from half an inch to more than an inch long and are extremely fragile. Each size looks a little different so they may be different species. Also seen are tiny ghostly, transparent, filametous jellyfish. Small ones a quarter inch in diameter to some about two inches across. Each duplicating the movements of the large ones seen in the summer in the Restigouche River and the Baie des Chaleur. They are the most fragile of the fragile organism I have ever seen. They live at this time of year in extremely cold water and may or may not be the young of the larger jellyfish mentioned. Gently scooping one up on a screen mesh causes it to fall apart although some parts appear to be still functioning, propelling themselves in the odd manner of the larger jellyfish. I’m sure that a water sample taken near the fishing light (they use a gas lantern now) would reveal an exciting little known world waiting to be discovered. Today when I see the runty smelts on display at local shops it bothers me. These smelts are all caught with nets which do not filter out the smaller ones and for some reason do not catch the larger ones. Smelts used to be graded as follows ”Extra“ anything over 12 inches, No.1 between 10 and 12 inches, No.2 between 8 and 10 inches, the rest were just smelts and were sold locally very cheaply 25 cents for 10 lbs. Those smaller than 5 inches were left out on the ice for the seagulls and were called 'Blinks'. Fishing with hook and line eliminates the catching of blinks. Most were No.2s with a large portion being No.1s. Perhaps two or three percent were extras. The largest I’ve ever caught were 14 inches and on a good night one could expect five or six of these. Of course my family could not eat all of the catch so I would go around door to door and sell as much as I could. The going price was ten cents per dozen. Three dozens for a quarter. Some of the buyers, especially those families who lived in the company owned houses and were the higher ups in the mill and the elite of the town would have you lay out your catch you had with you and select (high-grade) all the largest. I had a partial answer for that although it meant more walking. In a short time you knew who they were and went to those homes last. Some of these women would belittle you for the poor sizes asking three dozens for twenty cents. It worked for some because by this time I was tired walking from door to door and just wanted to get home. The best time to sell was Thursday because almost everybody ate fish on Fridays. One winter I think I ate smelts every day save Sunday. I ate them boiled, fried, made into fish cakes, into chowder and everything else Mom could think of. The roe when boiled with lots of salt was not bad, but it got so I could not stand the sight of a smelt whether I caught it, sold it or saw it in a store window. Fortunately Spring arrived and with it a change of diet. The 'Bag netters' would fish two miles or more upriver in the main North Channel. They had shanties about 10x12 feet which were better constructed. They would place tall poles about 10 feet apart on the ice and sew cut open potato and feed sacks together and fit them to the poles. When all was ready they would hoist the poles and set them down into chopped holes in the ice which would immediately freeze them into place. The arrangement provided a fence which would keep most of the wind off the fishermen while they worked their nets and also kept snow drifts to manageable heights. These windbreaks could be up to 300 feet long. If you can imagine hauling out 90 feet long bag nets with a ton or more of smelts in them from partially frozen slits in the ice at 3 o’clock in the morning, in twenty five below zero (F) in a howling Norwester, you can appreciate the value of the fence and the hardships suffered by those poor souls working in the darkness with only soaked woolen mitts to cover their hands for a catch that was worth commercially two cents per lb. The smelts had to be spread out onto the ice where they all froze solid within a few minutes. The fishermen then cooked their meals, likely smelts, beans, oatmeal poridge, or homemade bread and molasses, and rested while waiting for the next tide. During the day horses came out onto the ice and the fishermen, helped by the driver who would have frozen had he not worked, shoveled all the smelts into sleighs to be taken to Loggie’s freezer for sorting and packing into wooden boxes for the Eastern U.S., markets, principally Boston. One year Spring came early. We had a lot of rain and above freezing temperatures. Soon the ice took on the appearance of a shallow lake and it looked like an early ice breakup. Still some of the bag net fishermen stayed out. Now as long as the water stays on the ice it‘s supposed to be safe enough to support a horse. When the water disappears it means it has migrated through the ice and is unsafe. That year one fisherman asked my Father if he would come out with the team of horses and haul in his shanty. The ice had started to turn black and my Father declined. He offered twenty dollars and my Father said no. That evening Dad and my Grandfather talked it over and Grandpa said it could be done but twenty dollars was not enough to risk losing the horses. Next day Grandpa talked to the fisherman and offered him twenty dollars for the building where it was. The owner had asked everyone who had a horses but had been turned down by all and decided to accept the offer. Early the next morning Grandpa hitched the team to a set of bobsleighs and with additional ropes and chains set out onto the ice. The previous night had been cold enough to freeze the water still laying on the ice making what is known as 'Shell Ice'. It can be scary as the horses break through this layer at every step and one can never be sure there is solid ice underneath. Another problem is always the shoreline. In tidal waters there is almost always an opening between the shore and the ice at high tide, The opening can be from a crack to several feet wide and depending on where one went ashore it meant from a few inches to belly deep for the horses, Grandpa had it figured out. He would go out a few hours before dead low tide and hoped he could make it back at about the time the incoming tidehad started. Ice near the shore was always thick, as much as three feet, but out in the North Channel the norm is about 10 inches at best. He refused to have Dad go with him. Once on the ice he unhitched the team and took the pole off the bobsleighs and hitched up the first horse using about ten feet of chain between the bobsleighs and the horse. He likewise hitched up the second horse about ten feet from the first. He then tied long ropes around each horses neck and with extensions to the reins got on the bobsleighs and headed for the shanty about three miles away. My father and I walked along the railroad track which follows the river to be as near as possible. Dad had brought a light horse along and now left me on the tracks telling me that if he headed out across the ice I was to run home and tell Mom. I’m not sure what good this would have done as Mom could not have done much if an emergency arose. Grandpa was getting smaller and smaller the further he went onto the ice. Dad had now gone down the river bank and was on the safe shore ice walking the horse back and forth. Grandpa finally got to the shanty and it seemed a long time before anything happened. First one horse was one side of the shanty and the other on the opposite side. What he was doing of course was that after breaking the building loose from the ice he had to build a ramp of snow so that the shanty could be hauled onto the bobsleighs. He had anchored these to the base of the poles in the ice and by the use of one horse was able to maneuver the shanty into place. The two horses were hitched single file as before and Grandpa taking the long reins and the two ropes tied to the neck of the horses started towards shore, he walking as far away from the load as possible. It wasn’t long before he reached the relative safety of the shore ice and coming up to where he had removed the pole from the bobsleighs reattached them and hitched the team side by side in the usual way. His timing was off with the tide and now the crack along the shoreline was several feet wide and the water about two feet deep and rising. The team went into the water without trouble but somehow the shanty slipped of the bobsleighs. To Grandpa that was nothing he got up on one of the horses and hanging onto the harness galloped the horses home. The horses were wet almost up to the shoulders from the trashing in going through the water and up the steep bank on shore and now had to be dried in the barn and fed. After supper when the tide was at dead low Grandpa, Dad and a group of others went back and in short order had the shanty onto the bobsleighs and hauled into our yard. It was placed close to the barn and was used from then on for harness, tool and horse feed storage. It was torn down around 1948 when Dad sold the property. A bonus to the original owner was that there were two bagnets inside the shanty, one being new. Grandpa said he had assumed the building to be empty and had not looked inside. It also contained the stove and some wood and coal fuel. He said afterward that the shanty appeared awful heavy but attributed it to the ice that had clung to the bottom of the building. In any event the original owner was quite happy at recovering two nets and the other contents of the building. Grandpa and Dad were happy to have the use of the needed storage building. Dad got Grandpa to agree that he would never attempt another salvage of this nature again. That year there were numerous shanties seen floating toward the Baie des Chaleur when the ice broke up three days later.